Mandus Group is uniquely qualified to recondition M198 howitzers and has the past performance to prove it! Mandus Group is comprised of former U.S. Army government service personnel that designed, engineered, manufactured, and logistically supported the M198 howitzer throughout its service life with the U.S. armed forces and this extremely talented artillery team created the Inspect and Repair Program specifically for the M198 howitzer. Mandus Group has established a superb track record of success with its M198 Inspect and Repair Program having completed 120 howitzers for the Iraqi Army and another 54 for the Royal Thai Army. Both programs were completed ahead of schedule and on budget. 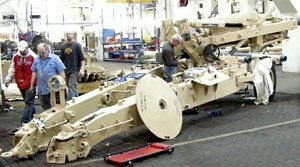 From the inception of a new project team members from Mandus Group will assist the customer country in handpicking the M198 howitzers that will enter the reconditioning program from the hundreds that have been decommissioned and stored at various locations in the U.S. Army and Marine Corps Depot system. Once the weapons arrive at Mandus Group’s facilities in Rock Island, Illinois, the members of the artillery recondition team inspect them and develop a specific repair strategy for each weapon. The howitzers are then disassembled and the component parts are sent to work centers for repair or replacement and painting. Our program includes a complete recoil rebuild as standard procedure. Once all of the parts that needed to be repaired or replaced are ready, the entire howitzer has been repainted, and the cannon barrel has been de-coppered and cleaned the artillery experts at Mandus Group will reassemble the reconditioned and restored howitzer which is now “Condition Code A” and ready for combat. The Mandus Group Inspect and Repair Process is a streamlined reconditioning program that eliminates redundant and unnecessary procedures thus dramatically reducing costs and ensuring an on time delivery. 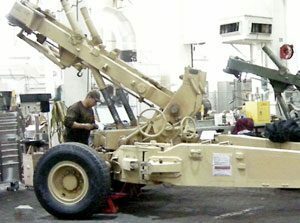 The Mandus Group Team is uniquely qualified to handle repair, modifications, and upgrades on the M198 howitzer considering their vast knowledge and experience with this weapon that dates back to its initial design and manufacture at the Rock Island Arsenal. This expertise is not limited to the M198 and also includes all current and legacy U.S. howitzers, the gun systems on self-propelled howitzers, as well as many internationally produced artillery models. Quality, affordability, and on time delivery are what you deserve and what you are guaranteed when you engage the Mandus Group Team for maintenance and repair work on your artillery fleet. Call the experts for a consultation on how they can help you maintain your howitzers in full mission capable condition.